Start your Norwex Business - Join my Team! 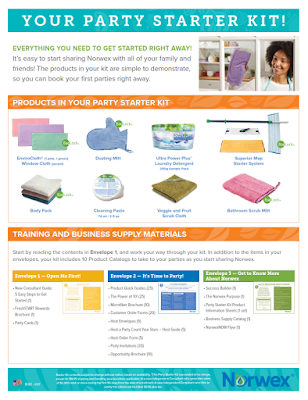 ...it costs $0 out of pocket to start your Norwex business with our Party Starter Kit*? If this sounds good to you, I'd love to have you join my Norwex team! At Norwex we do everything we can to support our Consultants. Our Party Starter Kit supports you getting off to a strong start and can be earned at no cost to you! Meaningful work - promote a healthier lifestyle and a greener planet for future generations - "A promise of a better future by improving quality of life by radically reducing chemicals in our homes and in our environments"
Completely flexible schedule - you work as much or as little as you wish, on your own terms and schedule. Host program is funded entirely by Norwex, not the consultant. The 4-Star Host Program encourages higher party sales and increased bookings by providing your Hosts with generous rewards. The kit includes everything you need to get started right away. 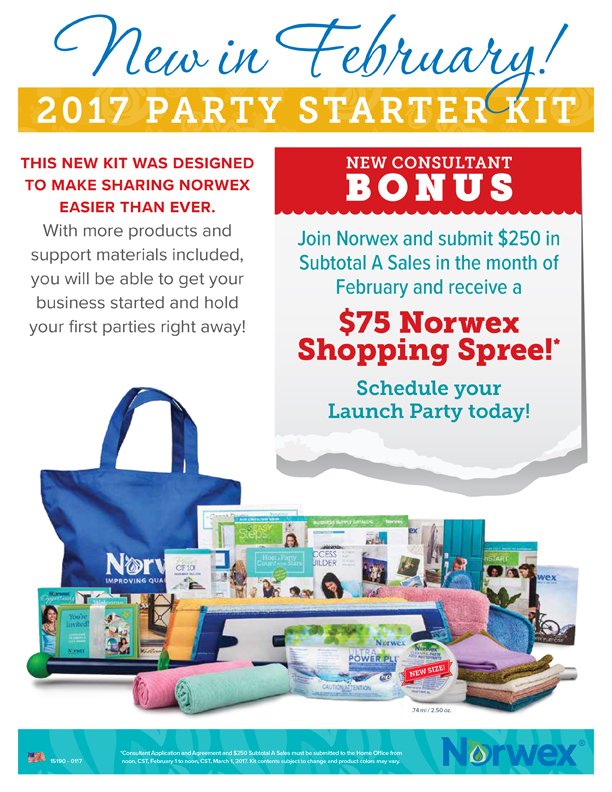 The Party Starter Kit makes it easy to start sharing Norwex with your friends and family - the products are easy to demonstrate so you can book your first few parties immediately! The Party Starter Kit includes a generous supply of our most popular products! FREE with sign up! PLUS Training and Business supplies to help you! Start by reading the contents of Envelope One, and work your way through your kit. In addition to the items in your envelopes, your kit also includes 10 Product Catalogs to take to your parties as you start sharing Norwex. Envelope One - Open Me First! Envelope Two - It's Time to Party! Envelope Three - Get to Know More About Norwex! ADDITIONALLY, you will be automatically enrolled in our FreshSTART Rewards Program to give you the opportunity to earn even more FREE products! Scroll down to learn more! Party Starter Kit contents subject to change without notice, based on availability. 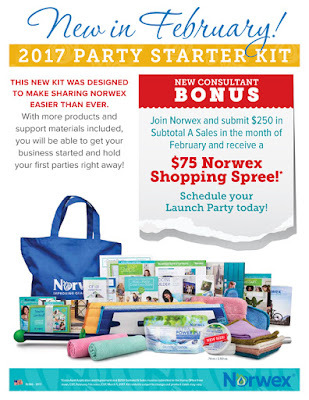 *This Party Starter Kit is provided at no charge, except for $9.99 shipping and handling plus tax where applicable, to a new Independent Consultant who generates sales of $2,000 retail or more during the first 90 days from the date of enrollment. A new Indenpendent Consultant who fails to satisfy this criteria will be billed $200 plus tax. Each Starter Kit Builder includes a selection of some of our most popular products and FREE business materials to try, love and share with the world as you launch your Norwex business. Use them to create your own Safe Haven, as party demonstrations or for gifting to your Hosts and Customers. 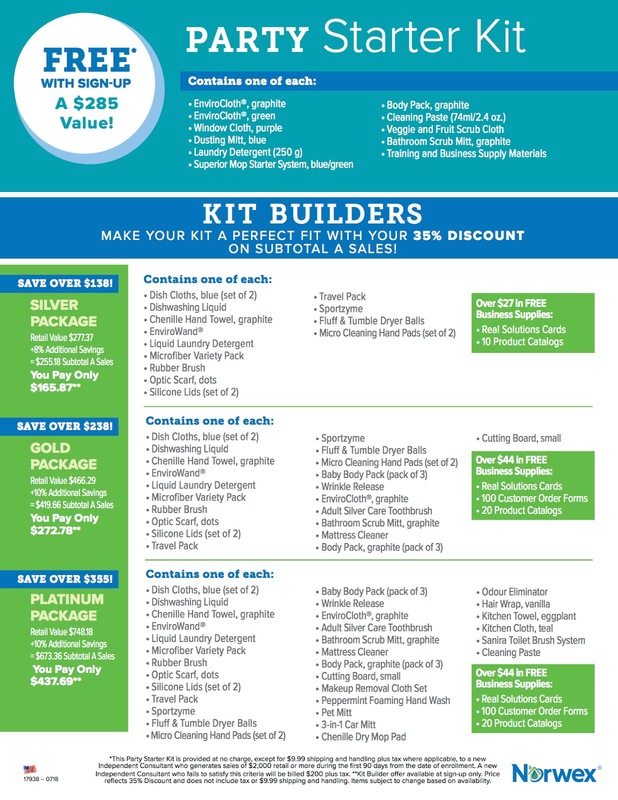 Choose from the packages below to make your kit the perfect fit for you. Get Engaged in your business with more products to love and share! With our most popular package, you earn your first FreshSTART reward which includes $135 in additional FREE product! 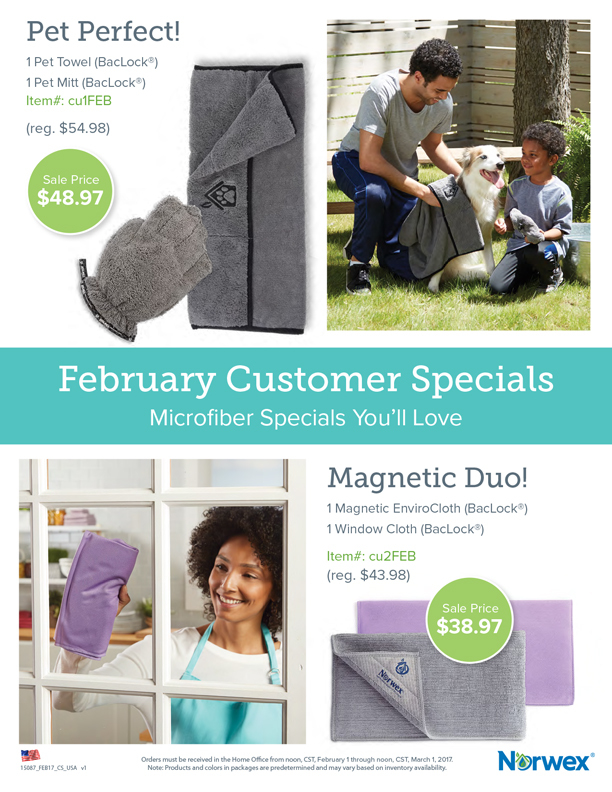 You’re on your way to earning even more rewards with this incredible selection of products and colors to launch your business! *This Party Starter Kit is provided at no charge, except for $9.99 shipping and handling plus tax where applicable, to a new Independent Consultant who generates sales of $2,000 retail or more during the first 90 days from the date of enrollment. A new Independent Consultant who fails to satisfy this criteria will be billed $200 plus tax. 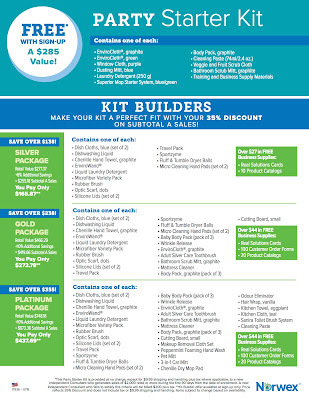 **Kit Builder offer available at sign-up only. Price reflects 35% Discount and does not include tax or $9.99 shipping and handling. Items subject to change based on availability. Every consultant who joins Norwex is able to earn FreshSTART Rewards for meeting sales goals and recruiting goals. They are NOT mutually exclusive - you can earn Step 2 without earning Step 1, for example. We make it easy for new Consultants to set achievable goals and earn exclusive rewards right from the start. In addition to the 35% Discount, new Consultants can earn approximately $700 in products and Norwex logo’d items by selling and recruiting during their first 90 days of joining Norwex. 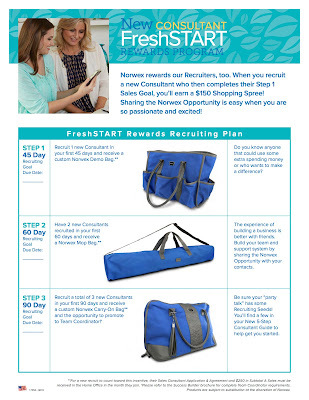 Norwex rewards our Recruiters, too. When you recruit a new Consultant who then completes their Step 1 Sales Goal, you’ll earn a $150 Shopping Spree! STEP 1 - 15 Day Sales Goal - Submit $400 in Subtotal A Sales in your first 15 days and receive over $136 in free product! STEP 2 - 30 Day Sales Goal - Submit $1000 in Subtotal A Sales in your first 30 days and receive over $188 in free product! STEP 3 - 60 Day Sales Goal - Submit $2000 in Subtotal A Sales in your first 60 days and receive over $232 in free product! **For a new recruit to count toward this incentive, their Sales Consultant Application & Agreement and $250 in Subtotal A Sales must be received in the Home Office in the month they join. †Please refer to the Success Builder brochure for complete Team Coordinator requirements. Products are subject to substitution at the discretion of Norwex. What are the requirements to be a consultant? 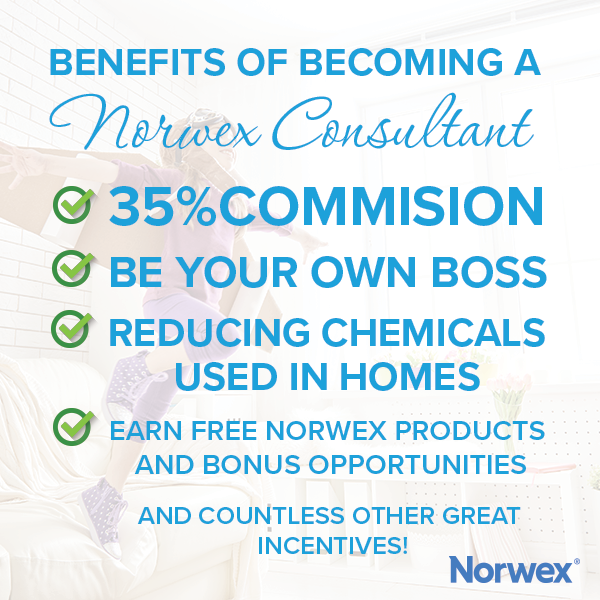 How much can I earn as a Norwex Independent Sales Consultant? As much (or as little) as you want! You earn 35% commission on all sales, from day 1 through your entire Norwex career. With an average party of $500, you'll earn $175. If you have four parties a month, that's $700. With eight parties a month, it's $1400. You set your own schedule, so it's entirely up to you! If you choose to build a team, you can also earn income on their sales as well. Is it REALLY free to join? What's the catch? Norwex really is generous! You have to pay $9.99 for shipping/handling and any applicable tax for your Party Starter Kit, but that's it. 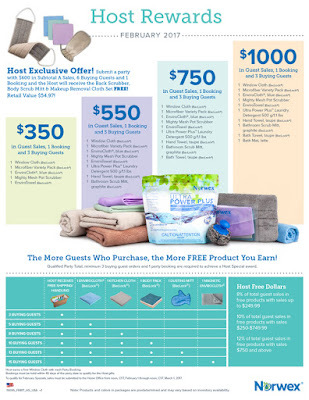 Norwex gives you 90 days to sell $2,000 worth of product to earn it for free. Now before you panic about TWO THOUSAND DOLLARS (which sounds like a huge amount!) the average party is $500...so $2000 is only 4 average parties over 3 months. Who can't give this a 4 party try? If for some reason you don't meet the $2,000 goal in 90 days, you just pay $200 for your starter kit, and it's worth more than that! And consider this - even if you only sell $600 worth of product in your first 90 days, you just made $210 with your 35% commission which would pay for your starter kit AND shipping! Is it worth it to upgrade my kit at signup? This is entirely up to you. Personally, I think it is - if you can afford it. If not, you'll have so many opportunities to earn free Norwex product that it's not the end of the world. 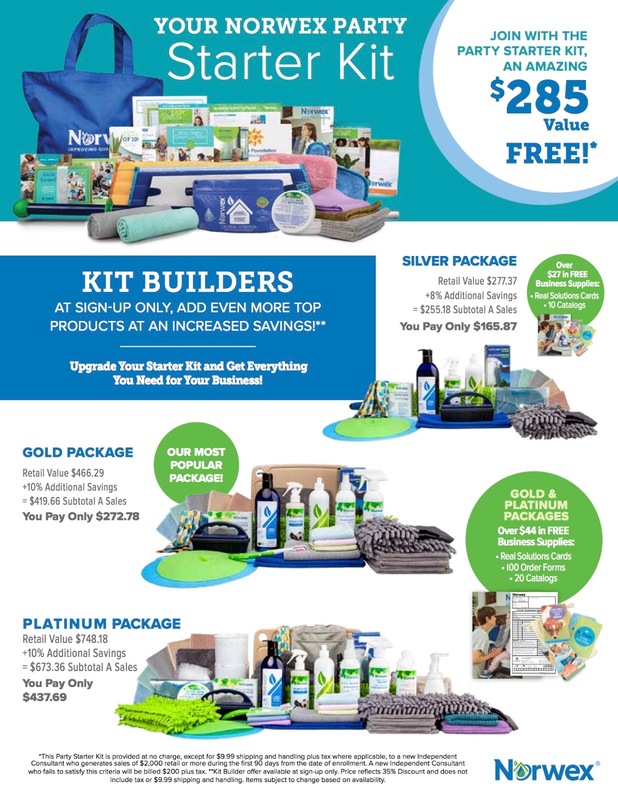 However, the upgrade counts towards your $2000 AND you receive a huge amount of Norwex products which is only good for you as a consultant, because you'll have extra items to demo and will be able to reference personal use when speaking to customers. Plan your launch party first, and sign up 10-14 days prior to your launch party. Timing is everything, and this will allow you to maximize your time with the Party Starter Kit while also allowing you time to achieve the first FreshSTART sales goal of $400 in 15 days! Do I have to do parties? I'm not a party person. No. You run your business the way you wish. However, you might find yourself naturally falling into the party role! Often, people sign up just for the discount (ahem, me! ), and then after using the products and seeing how amazing everything is, the discussion naturally happens with friends and acquaintenaces to remark about how amazing Norwex is. Just like that, you're on the path to earning income with Norwex, and hopefully the start of an amazingly successful business! Plus, Norwex is so generous to consultants and hosts, you'll find yourself wanting to earn all of the incentives offered. Do I have to keep inventory? No! 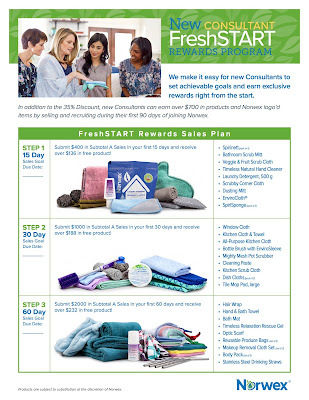 You might find yourself acquiring inventory after you start earning rewards, but you do not have to maintain inventory of anything - Norwex gives you the option to ship directly to you as the consultant, directly to the host, or directly to customers individually. How will I learn all this stuff about Norwex and the products? Luckily, you'll have me! I will personally train you, point you in the right direction and be there to answer your questions. I will help with your launch party preparation. Norwex offers tons of free training and resources through webinars, conference calls, meetings, etc. You will also be a part of an amazing team of thousands of consultants who have brilliant ideas to share. When you sign up, I will add you to a couple Facebook groups where trainings are offered, support is given, product knowledge is developed and ideas are shared. Orders must be received in the Home Office from noon, CDT, February 1 through noon, CDT, March 1, 2017. Note: Products and colors in packages are predetermined and may vary based on inventory availability. That’s a savings of $10.99! 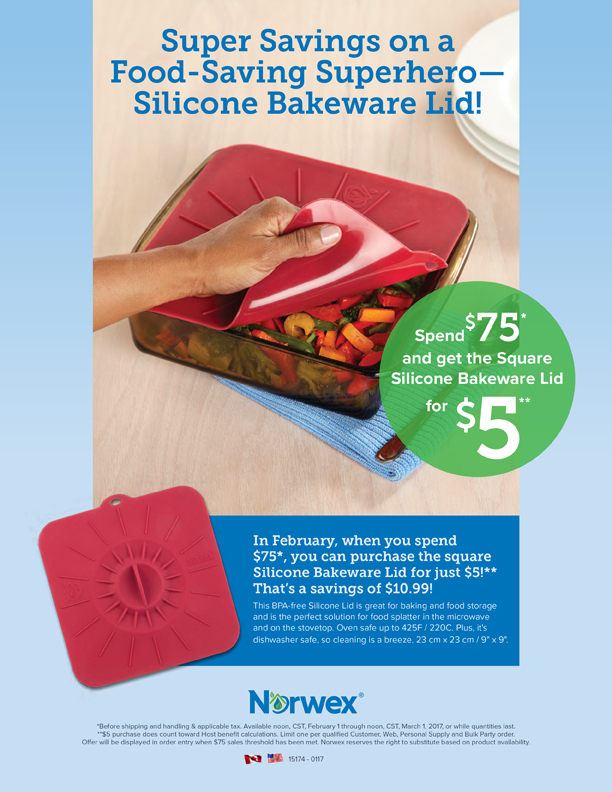 This BPA-free Silicone Lid is great for baking and food storage and is the perfect solution for food splatter in the microwave and on the stovetop. Oven safe up to 425F / 220C. Plus, it's dishwasher safe, so cleaning is a breeze. 23 cm x 23 cm / 9" x 9". *Before shipping and handling & applicable tax. Available noon, CST, February 1 through noon, CST, March 1, 2017, or while quantities last. **$5 purchase does count toward Host benefit calculations. Limit one per qualified Customer, Web, Personal Supply and Bulk Party order. Offer will be displayed in order entry when $75 sales threshold has been met. Norwex reserves the right to substitute based on product availability. Submit a party with $600 in Subtotal A Sales, 6 Buying Guests and 1 Booking and the Host will receive the Back Scrubber, Body Scrub Mitt & Makeup Removal Cloth Set FREE! All parties must be submitted to the Home Office from noon, CST, February 1 through noon, CST, March 1, 2017. *Consultant Application and Agreement and $250 Subtotal A Sales must be submitted to the Home Office from noon, CST, February 1 to noon, CST, March 1, 2017. Kit contents subject to change and product colors may vary.